Every AC:WW town is exactly the same size and all of the towns share the same basic structures. Although the layout of your town may differ from your friends' towns, they all have the same buildings that are shown here in this guide. 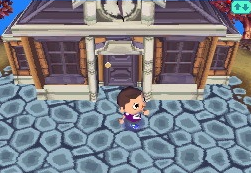 Check your town map (given to you by Tom Nook at the beginning of the game) to find where these familiar structures are located. There are some places you may want to memorize the location of very quickly (Tom Nooks and Post Office) because you will find that you visit them often. Use the map to the right to familiarize yourself with these common structures. 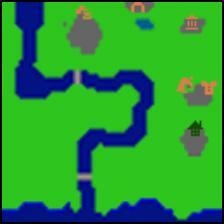 At first your house will be quite small, the roof color depends on the color you pick for your DS layout. The location depends on where you say you like living to Kapp'n at the beginning, for example if you say you like living near the museum, you will live near the museum! Inside you have your small downstairs where you can put furniture, and then an upstairs, where you can lie on your bed and save. After you start the game, and are introduced to your house, Tom Nook will give you your first mortgage, every time you pay off a mortgage your house will be upgraded, until you reach the full 'mansion' style, where you wont have to pay any more mortgages! Your house can be totally customized with wallpapers, carpets and furniture. Every room except the 'attic' can be furnished! When a shop upgrades it's interior expands, and more items are available at one time. When you have Nookingtons, paint is sold, so you can change the color of your roof at any time, 1 of 16 colors will be available everyday. Nookingtons also includes a hair salon, where you can get your hair style and color changed for 3000 bells. The first three stores are only one floor, but Nookingtons has two, on the first floor tools, paper, medicine and plants can be bought and on the second paint, furniture and wallpaper/carpets can be bought. On the top floor you will be 'served' by Tommy and Timmy Nook. 300 points- Member level, Nook's cranny model, no discount. 5000 points- Silver member, Nook 'n' go model, 5% discount. 20000 points- Platinum member, Nookingtons model, 20% discount. You can check your points balance by going up to the points machine and pressing 'A' or tapping it, then selecting balance inquiry. If you talk to any of the Nooks (that includes Tommy and Timmy) you get a list of services. If you want to get some money, select 'I want to sell', then using the stylus drag the items you want to sell from your inventory to the blue area, then click confirm to here the offer. If you want to sell select 'we have a deal' then you will receive the money and lose the items. If you decide you don’t want to sell you can select quit on the inventory screen, or 'no, thanks' after the offer. The second option is your catalog; select it to get a list of all the items you have ever bought/owned. Along the left side you have the groups, the leaf is furniture, the second is wallpaper, the third is carpets, the top is clothes, the umbrella is your umbrellas, the hat is accessories and hats, the paper is paper, the 'wooden' looking block are your nebuloids etc (dug up from ground; not orderable) and the skull are fossils (dug up from ground; not orderable). In the middle of your screen is the list of items, drag down the green circle to look up and down at the list, and select any item you want to order, it will display the price of the item, and a picture of it on the top screen. Click the trolley icon to buy the item, or select quit to exit the catalog. If you order an item it will arrive in approximately a day attached to a letter off Tom Nook. Inside the town gate you will find Booker and Copper, Booker, the dog on the left is in charge of anything town related, to find out if anyone special is in town select ‘what’s new?’ also to get free items from the lost and found select something lost to get the item screen of lost items. Drag any you want into your inventory to claim them! You can also change the design on the flag outside the town gate, when you select ‘change flag’ you will get the option to delete the current pattern and use a different one by choosing ‘use this’ or swap the patterns by choosing ‘swap it!’ (this is similar to the patterns in the Ables shop) or you can cancel by choosing forget it! If you select where am I, you will get the option to hear an explanation of the town flag, lost items or when someone special is in your town. The dog on the left is Copper; he handles anything to do with wi fi or visiting another town. To issue yourself a friend code you need WiFi and then select friend code, again, to hear an explanation of everything select where am I! There are many rooms to the museum. In the main entrance you will find Blathers. Talk to him and select ‘donate’ to donate any bugs, fish, paintings or fossils. If you want a fossil checked without donating it, select check a fossil and give it to him, he will identify it and return it. Once identified Nook will pay money for it, if its not identified its worth nothing! If you want to donate something that you are unsure has already been donated, select Exhibits to get a quick list of everything in the museum, switch between bugs, fossils, fish and paintings by tapping the icons at the bottom of the list, when you are done select quit to get a short announcement from Blathers on how good the collection is and to exit that screen. If you wish to hear the long story about the museum, choose 'Where am I?' From his main menu. From the main lobby you will see six doors to go through (not including the exit at the back). The bottom right door leads to the aquarium where you can see all the donated fish. The room in front of the aquarium is the fossil collection where you can view all the dinosaur skeletons and donated pre-historic items. At the top is the insect room where all the donated bugs and insects are displayed. Off to the left you can view the painting gallery, which will remain uncompleted for quite a while! Up the stairs you can talk to Celeste about your town’s observatory. Talk to her to get a rather small menu. Select where am I for a description, or ‘you’re cute’ to get an angry reply of ‘just look through the telescope.’ Constellations are the joined groups of starts you see at night on the top screen of your DS. 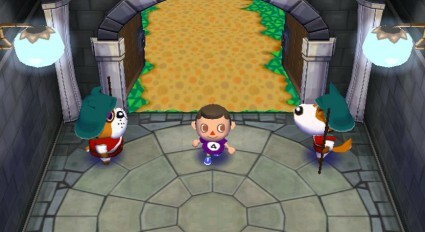 If people visit your town when it is night at your town they will be able to see them as well! Stand in front of the telescope and tap it or press ‘A’ to get some more options from Celeste, to create or modify a constellation select ‘constellations,’ to view the constellations made or to check when they are visible select ‘stargazing.’ If you want to erase one of the constellations made select erasing! You will probably visit the town hall quite a lot, wether it’s to mail a letter or pay off your mortgage. During the day you will find Pelly working their, but Phyllis takes over the night shift. You will always find the bulletin board outside on the left of the town hall, this is where you can write something or you can read about up-coming town events or other random things like the ‘talking to myself’ articles! On the inside there is the recycle bin to the right, any items residents no longer want are normally found here, you can take anything out of it or discard your own junk like tires you may have fished out of the stream/sea. On the floor at the front you can see two mats, one green with a house on and a red one with a letter on. Stand on one of them to be served for that particular part. The green mat area represents your civic center. Talk to Pelly/Phyllis to get the option menu. If you select ‘the environment’ you will receive a comment that reflects how tidy your town is. To get perfect status you will need plenty of trees and flowers, you will find Phyliss gives you a better idea of what you need to do to improve your town as she is more ‘rude’ about it. If you select ‘town tunes’ from the menu you can change the town tune, which is heard every time you talk to someone or when the town bell chimes on the hour. If you want to ‘donate’ to Boondox, an apparently poor town you can select donate from the menu, if you donate a certain amount you will receive letters from Boondox and sometimes a feather accessory for your hair. For more information and tips on donating, please visit the Boondox Donation guide. If you want to move a character from one game card to another you can select ‘im moving’ then make sure the other game card is set in immigration mode which is accessible from the main game menu. If you move you cannot take any of your items or music and your WiFi settings are erased! Now onto the red mat! This acts as the town post office; from here you can save any letters you want to permanently keep by selecting ‘save a letter’ and using the stylus to drag them from your inventory to the save slots, or you can mail any letters you have written by selecting ‘mail a letter’ and dragging them into the send slots and selecting confirm. You can also select ‘deposit’ to pay off some of your mortgage, this will probably one of your main uses in the town hall, when the pay screen opens you can select how much you wish to pay, it also displays how much you have left. This option disappears once all of your mortgages are paid. Finally you can select ‘access account’ to save or withdraw any bells you have; this becomes really useful when you have too much money as you can earn prizes by saving up a total of bells. Box of Tissues Save 1,000,000 bells. Pelly's Pic Save 100,000,000 bells. Phyllis's Pic Save 500,000,000 bells. Piggy Bank Save 10,000,000 bells. Town Hall Model Save 999,999,999 bells. Redd sells some items that aren’t available at Nook’s shop. He will always have three items in stock when he visits; 2 furniture items and a painting. Without talking to Lyle, Redd will appear on a random day of the week. If Lyle visits, he will stand outside your house, and temporarily follow you as you walk around. Talk to him and he will ask you what day you would like Redd to visit. When Redd comes for the first time you will not be able to get in because you didn’t receive a password off him in advance. What to do? Why talk to your residents of course! Eventually one of them will tell you the password. Head back to Redd's tent, which is always situated outside the town hall, and enter the password (all passwords are case sensitive). 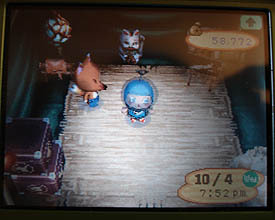 Once in you will have to pay a one time fee of 3000 bells to become his new ‘cousin’ before he will let you buy anything. Once you become part of his ‘family’ you will receive a letter with his password in advance every time he is coming (the password changes every time). Redd also charges higher prices than Nook would for his items! The ‘Redd only items’ that can only be bought from him give you an HRA score boost and cannot be bought from Nook (unless you order them after buying them). The paintings he sells can also be donated to the museum gallery, but completing the gallery will be a challenge because most of the time the paintings are FAKE! This means they are pretty much worthless, as Nook only buys them for 10 bells, to get 100 bells for a fake painting you will have to buy the insurance of Lyle. To determine if a painting is fake or not you will have to give it to Blathers or check your catalog. If the painting is added to the catalog it means it is real! Q: "Life Expectancy" A: "Redd is 35"
Q: "Spoiled rotten" A: "bean curd"